This is a list of recordings of Macbeth , an opera by Giuseppe Verdi. The first performance of the work was on 14 March 1847 at the Teatro della Pergola in Florence. 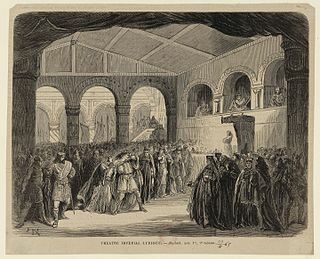 Verdi subsequently revised the work and the first performance of this version was on 21 April 1865 at the Théâtre Lyrique in Paris. The Teatro della Pergola is a historic opera house in Florence, Italy. It is located in the centre of the city on the Via della Pergola, from which the theatre takes its name. It was built in 1656 under the patronage of Cardinal Gian Carlo de' Medici to designs by the architect Ferdinando Tacca, son of the sculptor Pietro Tacca; its inaugural production was the opera buffa, Il potestà di Colognole by Jacopo Melani. The opera house, the first to be built with superposed tiers of boxes rather than raked semi-circular seating in the Roman fashion, is considered to be the oldest in Italy, having occupied the same site for more than 350 years. Some recordings  and some performances today incorporate both Macbeth's final aria before he dies (from the original version) and the revised version's ending with the soldiers' chorus. Opera Rara is a British non-profit recording company, founded in the early 1970s by American Patric Schmid and Englishman Don White to promote concerts of rare and/or forgotten operas by bel canto era composers such as Italian composers Gaetano Donizetti, Giovanni Pacini, Saverio Mercadante, and Federico Ricci, as well as French composers of the 1830s forward such as Giacomo Meyerbeer. Mihai Timofti - Master of Arts is a director, actor, musician and professor from Chisinau. Liudmyla Viktorivna Monastyrska is a Ukrainian spinto soprano. ↑ The 1976 Abbado version is one example.